Boodles is delighted to announce that next Sunday, 23rd March, the spotlight will be on Boodles as the brand is showcased with a fly on the wall documentary from the producers of the award winning 'Inside Claridges'. 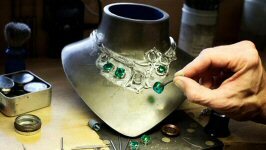 Titled 'The Million Pound Necklace: Inside Boodles' the programme will be an hour long and will air at 8pm on Channel 4. Having worked with the Garden Productions for a large part of 2013, Boodles is delighted and proud that the time has come to share this project with the public. The programme follows the creation of Boodles Emerald 'Greenfire' necklace, from loose stones, to design, creation and launch; shadowing Boodles Directors and staff each step of the way, with a cocktail party in Monaco, a Diamond buying trip to New York and a few celebrity interviews thrown in. Boodles is the leading British fine jeweller whose reputation has been built on the quality of their innovative design, quality and exceptional customer relationships and service. Boodles has nine shops - their flagship stores are on London's Bond Street and in Liverpool. There are three Boodles in the North West of the UK, one in Dublin, two further shops in London, a concession in Harrods Fine Jewellery Hall, and one in the newly re-opened Savoy Hotel. The company was founded as Boodle and Dunthorne in Liverpool in 1798 and has remained a family company; it is now run by brothers Michael and Nicholas Wainwright, together with Jody Wainwright and James Amos. To view the photo associated with this press release, please visit the following link: http://www.marketwire.com/library/20140317-The_Million_Pound_Necklace800.jpg.